VIPAccessEXCLUSIVE: Annie LeBlanc Interview With Alexisjoyvipaccess At The “Chicken Girls: The Movie” Premiere! No amount of words can describe just how much we adore the outstanding Annie LeBlanc! She truly is a ray of sunshine who radiates so much happiness and positivity everywhere and anywhere she goes. In fact, we don’t even know where to begin when talking about a young lady as magnificent as Annie LeBlanc is. Annie LeBlanc first stole the hearts of fans worldwide in the many marvelous videos shared on her family’s hit YouTube channel, Bratayley. Fans always enjoyed getting to see what this brilliant family was up to and we felt like they were an extended family of our own! Since then, Annie LeBlanc has totally been slaying the game in the entertainment world. She has a total of over 3 million subscribers on her very own YouTube channel and has a massive following on other social media platforms including Musical.ly, Instagram and more. Annie LeBlanc continues to establish herself as a multi-threat. This spectacular gal has been showcasing her exceptional and unrivaled, acting skills in many shows including in digital network Brat’s highly-acclaimed series, Chicken Girls and the network’s upcoming show, A Girl Named Jo. A Girl Named Jo actually takes place in 1963, so Annie LeBlanc will once again be able to show how much of a versatile actress she is and someone who can take on any role and do justice to it. Annie LeBlanc also shared her talent in the brand new Chicken Girls: The Movie which premiered today! When she’s not acting and working on her YouTube channel, Annie LeBlanc is also a stellar singer who has released several amazing, original songs and terrific music videos to go along with it. Needless to say, Annie LeBlanc is pure perfection and a phenomenal role model to all of her fans. She is someone who – with her hard work, her classy and fun-loving persona, and her determination – has accomplished so much at such a young age and will continue to have many more of her successes skyrocket. I, Alexisjoyvipaccess had a great time covering the premiere of Chicken Girls: The Movie and had an excellent time catching up with and interviewing the dazzling Annie LeBlanc again at the event. Annie LeBlanc dished exclusively to Alexisjoyvipaccess all about what it was like for her working on the film, what the experience was like working on her new show, A Girl Named Jo and so much more only in our VIPAccessEXCLUSIVE updated interview. Annie LeBlanc even gave out some superlatives to her Chicken Girls: The Movie cast-mates and revealed who she thinks is most likely to be president, who is the best dancer and more – hear what she had to say in our VIPAccessEXCLUSIVE updated interview below. Thanks for another amazing interview, Annie! 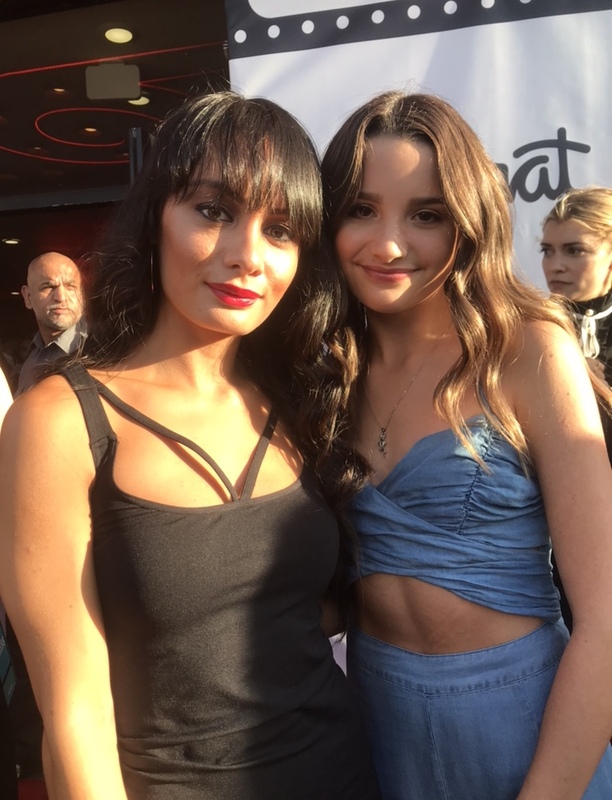 Check out my VIPAccessEXCLUSIVE updated interview with the wonderful Annie LeBlanc at the premiere of Chicken Girls: The Movie below. Be sure to watch Chicken Girls: The Movie out now on Brat! Previous Article: Panic! At The Disco Performed Songs From Their New Album At The “iHeartRadio Album Release Party With Panic! At The Disco” Event!